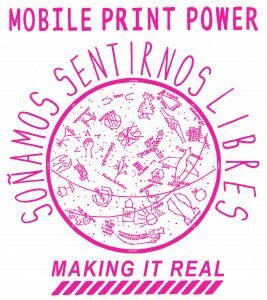 Soñamos Sentirnos Libres in Portland, Maine! Remember playing the game Telephone when you were young? One person whispers a statement to the person sitting next to them, then that person whispers it to their neighbor and on and on around the circle with the last person speaking the now radically changed statement aloud. 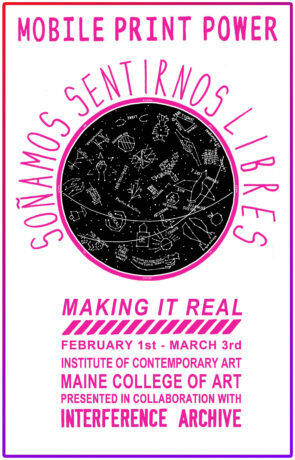 This exhibition features the collaboration between two printmaking studios, Zea Mays Printmaking (Florence, MA) and Peregrine Press (Portland, ME) and begins with one artist from each studio responding to a secret verbal prompt. 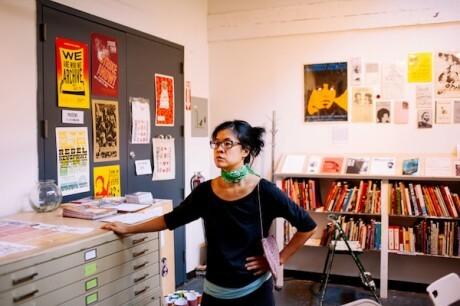 These two beginning artists will create a print that is a visual interpretation of the verbal prompt. The process will continue until 75 artists have participated over the course of five months. “I think that people are going to see reflected in this so much from their own life and from the contemporary world, more than we want there to be.” – Brad Duncan. 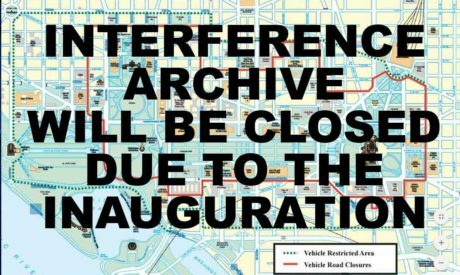 People gathered in New York at Interference Archive, a space immersed in the protests of the past, to create materials for the inauguration-week protests. 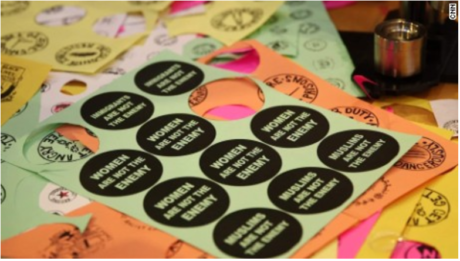 Over the weekend, an organization in Brooklyn called the Interference Archive gave away about five thousand stickers, three thousand printed posters, a thousand buttons, and almost two gallons of red and black paint that ended up silk-screened onto T-shirts, tote bags, and patches in the form of mottoes like “Don’t Mourn, Organize.” The occasion for the giveaway, Donald J. Trump’s swearing-in as President this week, was viewed with gloom by many who showed up on Saturday and Sunday. Parents, kids, and families! 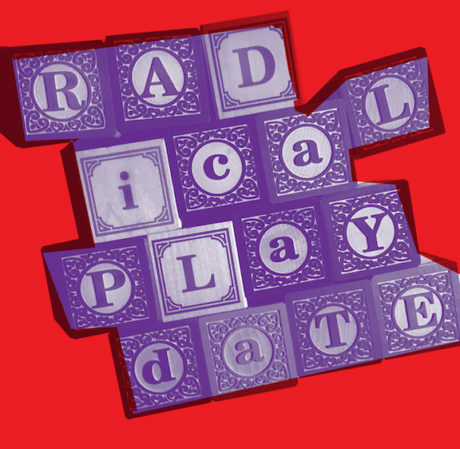 Join us for a Radical Playdate! In this “now more than ever” moment we’re exploring ways to be more family-inclusive in hopes of growing our community. We would love for you to be a part of it. We’ll have some snacks to eat, some picture books to read, some things to draw with, and some rad music to listen to. We’ll talk, and play, and plan. 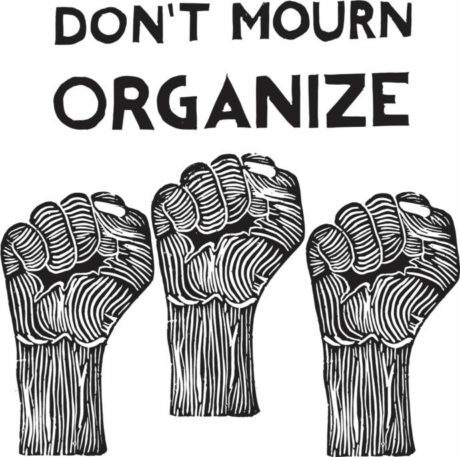 If you are able to bring a snack, a book, a song, or drawing materials to share, please do! 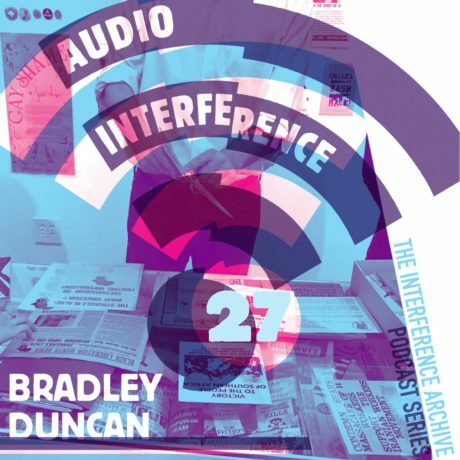 Interested in getting involved at Interference Archive? Please join us for a volunteer orientation! We will tour the space, give an overview of current projects, and will discuss ways new volunteers can get involved. We will also take some time to check out our new exhibition, Finally Got The News: The Printed Legacy of the U.S. Radical Left, 1970-1979. 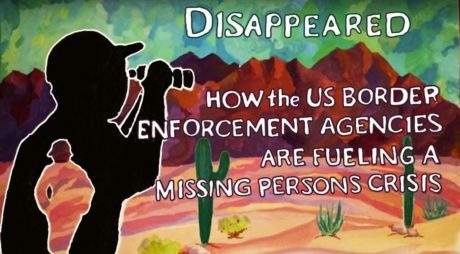 Please join desert aid workers from No More Deaths as they discuss firsthand accounts of trends in migration; human rights abuse documentation in Nogales, Sonora; migrant support in the Sonoran desert; and allied movement building in communities throughout Arizona. 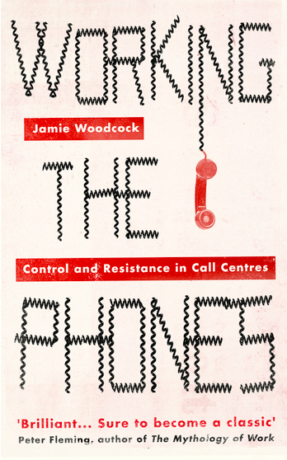 An author presentation & discussion with Jamie Woodcock, who spent time working undercover in a UK call center in order to provide insights into the daily experiences of call center workers, and to understand and analyze methods of control and resistance that exist within the highly regulated environment.